For all its family-friendly activities — from aerial parks to alpine slides — Colorado also abounds with experiences geared toward grown-ups. Whether you’re empty nesters or just want to get away for a weekend without the kids, here are some enticing vacation ideas for the 18-and-over crowd. Best part? They all include the greatest amenity of all: peace and quiet. Stay up past your (kids’) bedtime at this grown-ups-only urban retreat that fuses art and sustainability. Side-by-side Victorian homes sit on the edge of downtown Denver, putting you close to the city’s vibrant dining and nightlife. Many rooms feature murals or paintings by local artists, so you can soak up some culture from your in-room whirlpool tub. There are eco-friendly perks throughout, like organic toiletries and gardens where the onsite chef grows herbs and veggies for your complimentary breakfast. A sanctuary just for mature audi­ences all year long, Stonebrook Resort on Fall River offers plenty of peaceful settings, from seclud­ed outdoor hot tubs overlooking the river to private hiking trails that lead to Rocky Mountain National Park, just 2 miles away. Downtown Estes Park, with snug restaurants, breweries and wineries well-suited for a couples’ night out, is just 2 miles the other way. 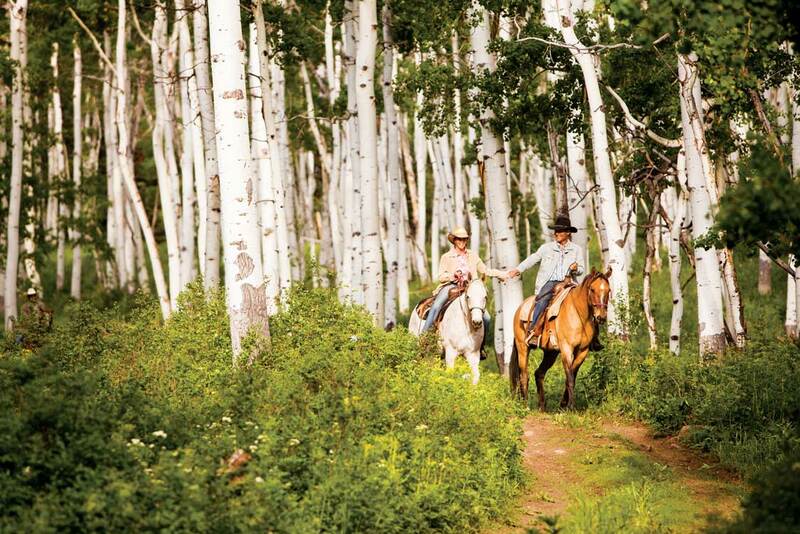 Colorado’s only Relais & Chateaux dude ranch offers a seemingly endless list of things to do, but creature comforts abound, too — from the elegant Western accommodations nestled in aspen groves to the haute mountain cuisine that has been hailed by Bon Appétit and Gourmet. In addition to adult weeks offered August through October, Home Ranch in Clark also hosts yoga and horse­back-riding retreats, perfect for girlfriend getaways. When it’s your turn for some pampering, escape to Smith Fork Ranch in Crawford within the secluded Gunnison National Forest, where romance and relaxation are as big of a priority as adventure. Indulge in sumptuous open-air massages, luxe cabins and candlelight dinners featuring farm-to-table cuisine from the ranch’s organic homestead. During adult weeks in September and October, activities range from archery to fly-fishing, if you’re not too busy taking it easy. Perched on the banks of the San Juan River in Pagosa Springs, this hot-springs haven offers a Relaxation Terrace with five pools that are only accessible to the of-age crowd. The terrace is tucked above the kid-friendly main springs area, and includes a waterfall, fire pit, roman shower, jetted tub and river overlook, along with blissful quiet time. Access to the terrace is complimentary for hotel guests and is available to day visitors for a small fee. While kids of all ages are wel­come at this Ouray resort, you’ll will find multiple kid-free corners available around the clock. The adults-only indoor sanctuary is open 24 hours and filled with spa-like stonework, including a spring-fed tub built from river rocks. Outside, a 102-degree soaking tub implements adult time from 10pm to 8am, enough to make any couple starry-eyed under the night sky. In the shadow of Great Sand Dunes National Park and Pre­serve, the quirky town of Hooper sits atop a natural artesian hot spring, with water flowing year-round into the family-friendly Sand Dunes Pool. On the same property, The Greenhouse is an all-indoor, all-adult oasis with three small soaking tubs and a 10-by-75-foot zero-entry pool. The Greenhouse also has a 10-person sauna, indoor gardens and an onsite bar to help you stay even toastier. By day, this forested hot spring just north of Steamboat Springs teems with families splashing in the all-natural pools. After dark, it becomes exclusively adults-only — and clothing-optional; don’t be surprised if you spy a cowboy or two taking a dip au naturel. Secluded hillside cabins and train cabooses are within sprinting distance from the pools, for those cooler Colorado nights. Summer in Denver heats up with this saucy four-day festival featuring international headliners, variety shows, parties and burlesque classes. Held in July, the festival takes place at Lannie’s Clocktower Cabaret and other locations. With the risqué moves and barely-there costumes, you’ll want to call the babysitter for this one. If it’s true that the couple that cooks together stays together, then Uncorked in Centennial is saving relationships by the class-full. Couples can cozy up in the kitchen while professional chefs work with them individually to prepare a pre-fixe, themed menu. Classes include Bourbon & Beef and Cooking with Chocolate, and come with a well-earned bottle of wine per couple. Read Get a Sitter: Adults-Only Weeks at Colorado Dude Ranches.